In modern parlance Richard Rimmer appears to have been 'head-hunted' for the position of Hon. President: He was elected a member of Society, probably at a meeting of council, late n the 1887-88 session and on the 5th October 1888 immediately following he was duly elected Hon. President. TDGNHAS, Series II, Vol. 6, pp.66–68. Meeting of 10 November 1888. PRESIDENT’S ADDRESS. The President [Richard Rimmer, F.L.S.] read a short inaugural address to the following effect :- Ladies and Gentlemen,- The first duty incumbent upon me this evening is to thank you very heartily for the honour you have done me in electing me to your presidential chair. When your wish that I should become the President of this Society was first intimated to me, I confess that, for a moment, I was somewhat doubtful whether I could conscientiously undertake the responsibilities pertaining to that office, but the invitation was conveyed to me in terms so cordial and so pressing that I felt myself bound in common courtesy to accept it, and this I did the more readily because it seemed to imply on your part a confidence in my ability to serve you, which was by me as unlooked-for as it is, I fear, unmerited. It will, however, be my earnest endeavour, so long as I occupy this chair, to do my little best to promote the welfare of our Society. I will now make a few remarks respecting the progress which has been already made by the Society towards the attainment of the ends for which it was originally instituted, as well as some of the means by which it may best achieve that which still remains to be accomplished in the future. These remarks must, however, be very brief, because I rejoice to see that we are to be favoured with two communications which will, I am sure, be more attractive to you than anything I have to say this evening. I have not yet had an opportunity of reading any of the Transactions of this Society except the last, which has recently been issued; but I gather from its pages quite enough to enable me to congratulate you heartily upon the work which has been done ... And now a word about the mollusca. It is much to be regretted that the study of these creatures has, in this district, been hitherto greatly neglected. If they are looked down upon with contempt by those who know but little about them, it ought to be remembered that nothing which the Almighty has seen fit to create can possibly be unworthy of our contemplation. To those, however, who would wish to make amends for neglected opportunities there is the satisfaction of knowing that a new field for research lies open before them in this locality, and to me it has always been a source of intense pleasure, so far as natural history is concerned, to find myself on hitherto untrodden ground. Some of you at least may not be aware that a few years ago conchological maps of every county in Great Britain and Ireland, showing the distribution and number of species of land and freshwater shells then known to occur in each county, were from time to time being published, and I was astonished to see that Dumfriesshire stood nearly, if not quite, at the bottom of the list, and deserving to wear the dunce’s cap! Now, I want some of you to help me to blot out this stain upon our character as naturalists. Of course it is but little that I have been able as yet to effect in this direction, but that little convinces me that a diligent and persevering search will reap a rich reward. I trust, therefore, that our knowledge of the mollusca of this district will in the coming year be largely increased, and then I shall be glad, if permitted, to speak to you at greater length about them than I have been able to do this evening. In conclusion, I would strongly urge upon you the necessity of striving to do original work. This will bring you face to face with Nature. Listen to her teachings, which, if rightly learnt, will help you to shake off the fetters of self-pride which are too often wont to stay our progress, and then she will lead you step by step onward and upward until you are enabled to form a better, though still feeble, conception of the stupendous majesty of Nature’s beneficent Creator. TDGNHAS, Series II, Vol. 6, p.268. 7 June, 1890: Field Meeting to Terregles, Holywood and Dalawoodie. Dalawoodie, as all Dumfriesians know, is one of the most delightfully situated country seats in the vicinity, immediately overlooking one of the prettiest reaches of the Cairn ; and the spacious and picturesque mansion is in keeping with its pleasant surroundings. Here the large party were hospitably entertained by Mr and Miss Rimmer; and they were afforded an opportunity of examining rich collections illustrative of natural history and numerous artistic objects which bespeak the learned pursuits and refined tastes of the owner. Mr Rimmer is a distinguished authority and author in the department of conchology, and possesses a magnificent cabinet of British shells. Botany has also engaged much of his attention, and the fruits of his industry are apparent in a wealth of mounted specimens. Numerous fine examples of antique oak carving, of embossed copper work between two and three centuries old, and of early art in other forms, add a charm of their own to the elegantly furnished apartments. Mr Rimmer possesses some fine specimens of antique furniture carved, and rare old china ; and those who visited the Fine Art Exhibition in Dumfries do not require to be told that he has turned his attention with good purpose also to the gathering of rare old engravings. A very pleasant hour was spent in the gardens and grounds, which are most tastefully laid out and beautifully kept. The botanists found much on which to question their genial host, and his store of information was readily at their command. Having expressed through Major Bowden their thanks for the hospitality which had been extended to them, and been assured by Mr Rimmer that he would be delighted to have them again as his guests next season, the party left about seven o'clock and drove in to Dumfries. TDGNHAS, Series II, Vol. 7, p.139. Saturday, 11th July, 1891. A garden party was given by Mr Rimmer, the President of the Society, at Dalawoodie, at which 25 members were present. Richard Rimmer is perhaps most well known for his publication The land and Freshwater Shells of the British Isles. This was first published by Bogue, London, 1880 and a second edition appeared in 1907 published by John Grant, 31 Geoerge IV Bridge, Edinburgh. The volume is interesting in being illustrated photograpically using images "of the natural size" and using the "Albertype" process. On several occasions I have been taken, or (as I would fain hope) mistaken, for a lunatic. On the last occasion I had wandered forth with the twofold object of escaping for a time from the din and turmoil of our British Babylon, and of enjoying a "ramble in search of shells"
Pursuing a path that led across some meadows, I came upon a little band of working men, who, seated under a hedge, were spending their Saturday afternoon holiday in the full enjoyment of the "fragrant weed," and of an occasional "pull" at a soda-water bottle containing a liquid not unlike water in colour, and very like "Old Tom" in fragrance. After passing the happy group, a very few paces brought me to a likely-looking spot wherein to find some of the objects of my search, to wit, a deep and tolerably dry ditch; so down I went into it and disappeared. I well knew what would follow; the men who had witnessed the mad-like act followed and peered at me as I "grubbed" about the bottom of the ditch. After a few moments of awful silence, one of the party, bolder than the rest, ventured to ask, "What are you doing there ?" "I am looking for shells." "Shells!" he exclaimed, at the same time casting a glance full of meaning towards his companions. "Shells! If you want shells you should look for them on the sea-shore; there are none here. You had better come out of that ditch and go home." My reply was a silent one, but it was convincing. I picked up a stone and handed it to him; on the side which had lain next the damp ground there were two or three specimens of Zonites nitidus. The men stared first at the shells and then at me, in evident astonishment; and from the remarks they made to one another it was clear that, even if they still believed me to be insane, the thought was beginning to dawn upon their minds that there might perhaps, after all, be "some method" in my madness. To be brief, I most gladly complied with their request that they might be permitted to accompany me in my ramble. On parting from them in the evening, they one and all declared they had spent "a happy day," and expressed their determination to employ, for the future, some of their leisure hours in studying the habits of the creatures the outlines of whose history I had, during our walk, endeavoured to trace. Great, however, was their disappointment when, in answer to their inquiries, I confessed my inability to recommend them a book containing descriptions and illustrations of all the species at present known, which could be purchased at a price suited to their means; and after I had left them I began, for the first time, to think I really must be mad, for in my eagerness to console them I had rashly promised to write one. 12, Westbourne Cresent, Hyde Park, W., July 8, 1880. Extract from the 'Ornithologists of Dumfriesshire' in Hugh S. Gladstone's The Birds of Dumfriesshire — Witherby & Co., London, 1910.
p. xxviii. RIMMER, RICHARD, of Dalawoodie (Holywood), b. May 25th, 1826. Educated at Liverpool and at Exeter College, Oxford. J.P. for the counties of Dumfries and Suffolk. A keen all-round naturalist and a high authority on conchology and malacology. One of the first scientists to employ photography in connection with natural history study. Elected a Fellow of the Linnaean Society, May 1st, 1879. Published in 1880 The Land and Freshwater Shells of the British Isles, the work being illustrated by photographs taken by the Albertype process under his personal supervision. In 1887 he went from Westbourne Cresent, Hyde Park, to St Albans, and after two years in that town he removed to Dumfries. 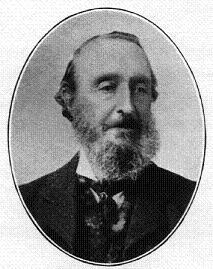 He was elected a member of the Dumfriesshire and Galloway Natural History and Antiquarian Society, September 8th; and President, October 5th, 1888. From time to time he contributed interesting ornithological notes to the Transactions of that Society. He was one of the original members of the Dumfries and Maxwelltown Observatory Museum Committee, and succeeded the late Patrick Dudgeon of Cargen as President in April, 1895, which office he held till his death on August 19th, 1905. Richard Rimmer's large collection of mounted birds, most of which had been obtained in Dumfriesshire, was presented to the Observatory Museum about 1860, but perished by imprudent handling and neglect some ten years later. Fortunately his great conchological collection, presented by him and arranged by his own hands, may still be seen at the above Museum, intact and in beautiful condition.